The Devonian-aged Marcellus Shale is an unconventional reservoir that produces natural gas, NGL and oil and is the largest and most prolific unconventional natural gas reservoir in the U.S., producing nearly 35% of total U.S. natural gas supply in 2018. Antero Resources believes that the Marcellus Shale is a premier North American shale play due to its consistent and predictable geology, high well recoveries relative to drilling and completion costs and significant hydrocarbon resources in place, which collectively provide for attractive well economics. 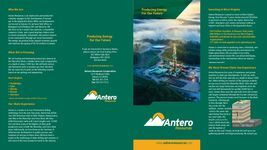 Download PDF to learn more about leasing Marcellus Shale rights to Antero.